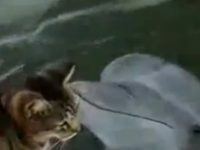 This video of Cats and Dolphins getting to know each other is so surprising and unusual I just had to bring it to you for your enjoyment. It has been seen by many but if you’re like me it may be your first time. I found this video that has a cute song created just for this Cat and Dolphin play date. Whether you are a Cat or a Dog person you will enjoy this. I’ve never even imagined such a rare connection before. It may speak to the ability that cats and dolphins have to communicate in a way we may recognize but not yet understand. I know you will enjoy this cute and funny video of Cats and Dolphins getting to know each other.